Get vibrant color and excellent results on challenging photo print jobs with chromatic red ink and uniform gloss. HP Vivid Photo Inks help you respond to high-production needs by providing reliable, high-quality, cost-effective printing. 1 Performance may vary based on writing system differences. 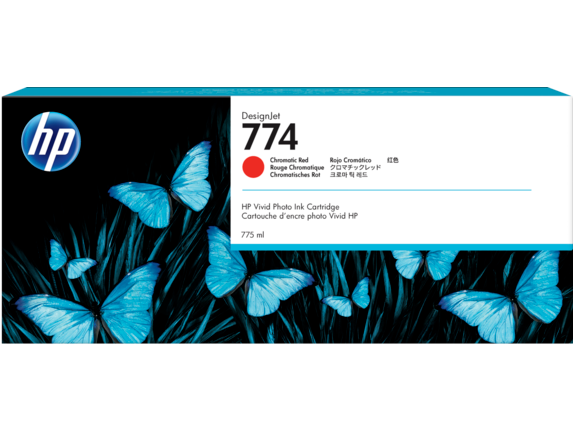 Print permanence estimates by HP Image Permanence Lab based on the same formulation of HP Vivid Photo Inks used with the HP DesignJet Z6200 Photo Production Printer, using 6 inks. Water resistance performance varies based on printer and print profile. Water resistance testing by HP Image Permanence Lab on a range of HP media and follows ISO 18935 method. Display permanence rating for interior displays/away from direct sunlight by HP Image Permanence Lab on a range of HP media. For more information, see http://www.HPLFMedia.com/printpermanence. 2 Recyclable HP papers can be recycled through commonly available recycling programs, or according to region-specific practices. Some HP media are eligible for return through the HP Large Format Media take-back program. Programs may not exist in your area. See http://www.HPLFMedia.com/hp/ecosolutions for details. 3 BMG trademark license code FSC®-C115319, see http://www.fsc.org. HP trademark license code FSC®-C017543, see http://www.fsc.org. Not all FSC®-certified products are available in all regions. For information about HP large format printing materials, please visit http://www.HPLFMedia.com. 4 Visit http://www.hp.com/recycle to see how to participate and for HP Planet Partners program features and availability; program may not be available in your area. Where this program is not available, and for other consumables not included in the program, consult the Material Safety Data Sheet (MSDS) available at http://www.hp.com/go/ecodata to determine appropriate disposal.